For my fourth novel, I returned to the world of Siegel City, but not the one we saw in Other People’s Heroes. While OPH was very much a contemporary novel, in The Pyrite War I hearkened back to the city’s early days to tell the tale of Siegel’s very first superhero. 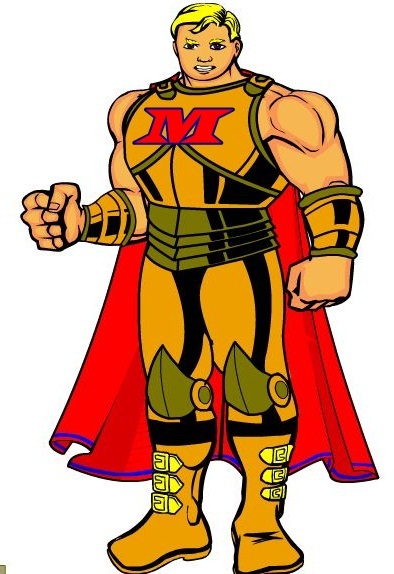 On the cusp of America’s involvement in World War II, the world only knows of one super-powered champion: Guardian M, protector of Siegel City. 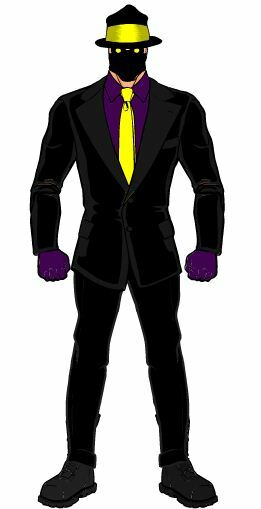 When young Gabriel Ruston discovers powers of his own he sets his sights on becoming the second champion, but dies in a tragic incident on his first night in costume. When his brother, David, finds evidence that Gabriel’s death was no accident, he is forced to join with a frightened underground to uncover the truth about the man everyone idolizes. In Siegel City, nothing has ever been what it seemed… not even in a Golden Age. This book is partially my tribute to the origins of the superhero, partially a way to flesh out and develop the world of Siegel City. Fans of OPH will find a whole new cast of characters, but a few of them may just have links to people we’ve seen before. Available as an ebook at Amazon.com ($3.99). Available at the Barnes & Noble Nook store ($3.99). Available at the iPad bookstore ($3.99). Available at Smashwords.com for every eBook format ($3.99). Available in print at Amazon.com ($15.49). And don’t forget, guys — reblog! Tweet! Share! And please post your reviews at all of the above websites and at Goodreads.com! The Pyrite War — now digitally AND in print! And much more! So if you’ve been waiting to read The Pyrite War in print, it’s now available at Amazon.com! For the rest of you weirdos with your “e-readers” and your “fiber optic cables” and your “macrobiotic diets,” there are two ways to get your fix, with more on the way. If you’ve got an Amazon Kindle or any device with a Kindle app, it’s available in the Kindle Store. If you’ve got a Nook, a Kobo, or any of those other readers, you can buy the book at Smashwords.com in a variety of electronic formats! Basically, you can bring the book to you in any form other than carrier pigeon, and I’m working on that as soon as I can figure out how many of them it takes to carry a Kindle tied to their ankles. Spread the word! The Pyrite War is well and truly here! *-For a very brief period of time in a ridiculously specific category that it doesn’t, technically, belong in. The Countdown Is Over! The Pyrite War is here! I hope you’ve enjoyed the past 12 days of glimpses at the characters in my newest novel, The Pyrite War. This is a story that’s long in the making and one that I’m particularly proud of now that it’s here. As the newest tale of Siegel City, the first novel-length Siegel City story since Other People’s Heroes, it’s something I know people have been waiting for. 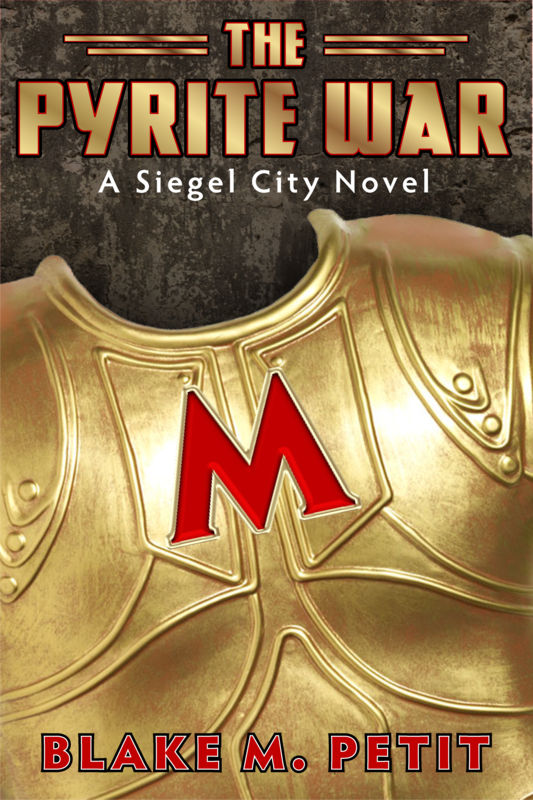 Set in Siegel City’s Golden Age, The Pyrite War is the story of David Ruston, a father, husband, and brother, who lives in a world where there is only one superhero — the omnipowerful Guardian M. David’s brother, Gabriel, discovers a power of his own and decides to emulate his city’s hero, but something goes terribly wrong. Without any Gifts to defend himself, David is drawn into a hunt for the truth about what happened to Gabriel and for what’s really going on with his city’s defenders. Because you see, friends, in Siegel City, nothing has ever been what it seemed… not even in a Golden Age. The eBook edition of The Pyrite War is currently available from Amazon.com for $3.99 — that’s 314 pages of action, thrills, and surprises. Have a different eReader? No problem! Smashwords.com has it too, in ePub, mobi, PDF and several other electronic formats. Still not good enough? Soon, the book will crack into the Barnes & Noble Nook store and the iPad bookstore (I’ll let you know when those are available). And are you one of those fine, old-fashioned folk who prefer your books on paper? That, too, will be an option in a matter of days. Keep checking this blog or my Facebook page for updates. So you’ve bought The Pyrite War. You’ve read it. You’ve consumed it. You loved it. What can you do next? Well, the obvious answer is to bounce to my now available page and snare any of my other work that you’ve somehow missed. But come on, who are we kidding here? You’re a true blue Evernaut, right? You’ve already read all this stuff! In that case, friends, the best thing you can do for me is to write a review. Post it at Amazon, Smashwords, wherever you bought the book. And don’t forget to add your review and ratings to this book (and my others) over at Goodreads as well. And heck, while you’re on Goodreads anyway, follow my author page or send me a friend request. I write because I love it, friends, but I need your help to make a bigger splash. Each time you buy a book, each time you share a link, each time you post a review, it helps raise my profile and it helps more copies of my work make their way into the ether. And when you’re doing this all by yourself, like I am, you need all the help you can get. Thanks. Powers: Unknown. Although there are no records of Nightshadow using any measurable metahuman abilities, the extent of his activities leads many historians to speculate he had a number of powers he kept hidden from the general populace. Notes from the Simon Tower Archive: Mister Mysteriouso himself. The first man to use the Nightshadow name has remained a complete enigma even today. I asked the current Nightshadow about him once, and all he would tell me is, “If you’re not in the suit, Josh, you don’t need to know.” There must have been something about this guy, though. He started the first superhero legacy. In 1939 Siegel City only had one superhero, the world’s first. When he discovered his powers, Gabriel Ruston thought he would be the second, but died on his first excursion in costume. After Gabriel’s death, his brother David is drawn into an investigation. What if Gabriel wasn’t the second? What if there were others? What if something tragic happened to all of them? In Siegel City, nothing is ever what it seems… even in a Golden Age. THE PYRITE WAR BEGINS TODAY. Powers: Guardian M’s powers were numerous and varied. He was known to possess the abilities of flight, super-strength, invulnerability, enhanced senses and a number of other powers, with more being added seemingly regularly for the duration of his active time in Siegel City. Notes from the Simon Tower Archive: There he is, Mr. America. The first superhero in the world, the guy everyone else has aspired to be ever since. It’s still amazing to me, all these years later, that no one has ever found out his secret identity, or for that matter, what really happened to him in the end. All I know is that even Lionheart admired this guy, and that sure as hell means he’s someone I’m going to look to for inspiration. 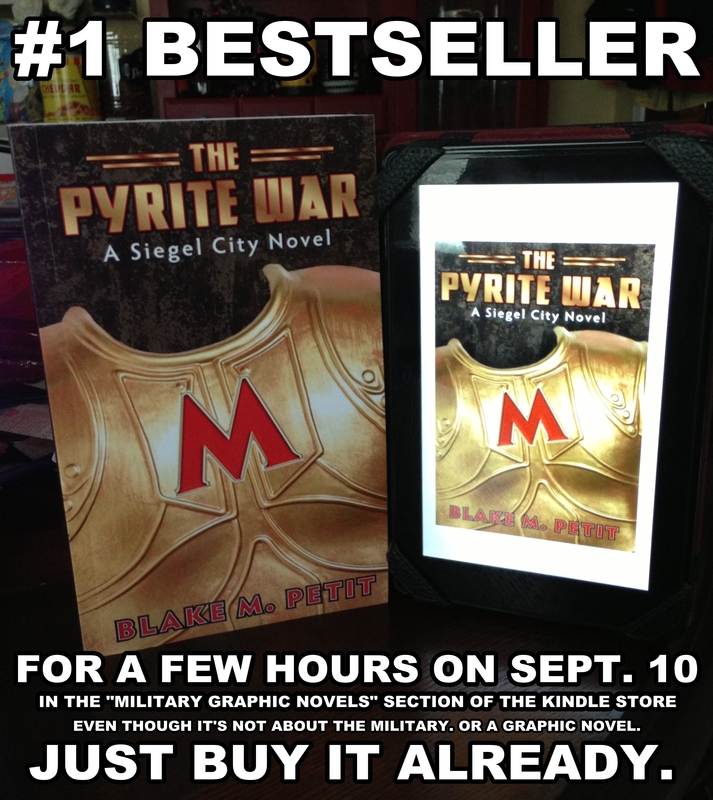 THE PYRITE WAR launches on September 10, 2013. Prepare for battle. Powers: Undetermined. 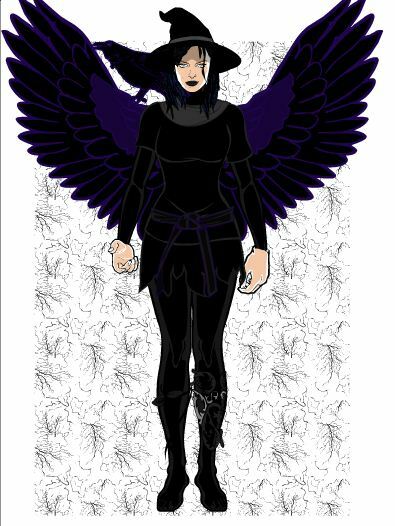 Witch Raven was observed demonstrating a number of “magical” powers, including flight and the control of animals, but whether these powers came from genuine magic or a sort of metahuman enhancement remains unknown. Notes from the Simon Tower Archive: This girl was emo before emo was a thing. Flying around, sending her flocks of angry birds to attack people, slapping them with spells that knocked them into submission. I’m still not sure where I stand on the whole debate of “magic versus metahuman powers,” but no matter what she was really doing out there, she was effective as hell. I put out a call for bloggers, podcasters and book reviewers. If you’ve got any of those and you want a free review eBook of The Pyrite War, just let me know! The All New Showcase gave us One-Shot #11: Villains Month Mumbo Jumbo. And I talked about comics making a bad week a little better in Everything But Imaginary #497: When You Least Expect It.